When arriving in a new place we usually take a stroll to get a feel for our surroundings. In York that meant walking around town via the city walls. At 3.4 kilometres York's are the longest medieval walls in all of England and while we met only a few dozen people we learned 2.5 million folks climb the steps each year to walk all or part of it and enjoy the spectacular views. We walked part of the wall yesterday, and another section today, but still have more to go. At one time the city wall was a continuous circle. Today it's broken up at certain points to accommodate roadways, cars and trucks. 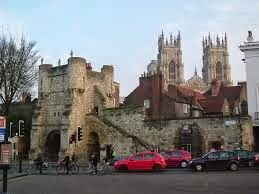 There are five main gateways, or bars as they're called in York, and 45 towers. The tower I'm standing in front of (above) is just down the street from where we're staying. The more elaborate one below is a 10-15 minute walk from where we began. The views are amazing. John took the shot of York Minster from the wall. I was literally too overwhelmed to grab my camera! Some sections are fenced, especially if the wall passes over a busy street, while other areas have no guardrails at all. Today we began via Bootham Bar that's not far from the Minster. Again, there was no time to capture it on film. We both rushed under the arch and climbed the stairs as fast as our feet would carry us. At the top, however, we did take a moment to savour the view. This section is just literally steps away from Boothham Bar. Further along the walk provides spectacular views of the Minster as well as the buildings and gardens around it. The size of the city wall is deceiving, especially in the photo below. The 5' wide pathway is the narrow strip wedged between the top of the stone wall and the 4' tall white fence running parallel to it. Almost every guard tower provides a photo opportunity. The tallest tower in the distance (above John and slightly to the left) is Monk Bar (gate). Housed inside the Monk Bar tower is an exhibit devoted to King Richard III. He visited York during his short reign (1483-1485), and like modern day politicians used the opportunity to campaign for the local's support. How? He commissioned 8000 badges to be made and gave them to those loyal to his cause. The video we watched today in the Yorkshire Museum before we walked the wall explains it better than I ever could. By the time we reached the end of this section of the wall the sun had set below the horizon. Fortunately, there was just enough light to capture Monks Bar tower with traffic racing beneath its arch. We're looking forward to completing the full circuit of York's City Walls.